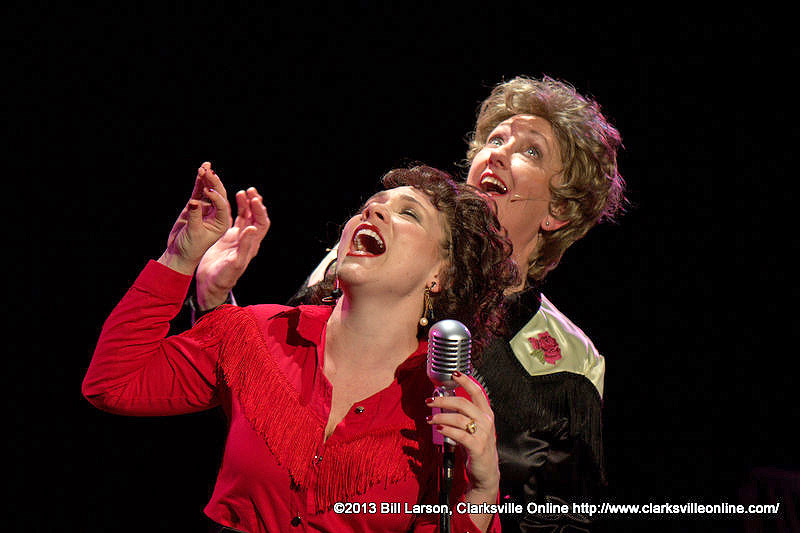 Clarksville, TN – The Roxy Regional Theatre is currently staging their production of Always… Patsy Cline, a musical revue featuring the lovely Jacque Clydesdale as Patsy Cline and the talented Leslie Green as Louise Seger. The show tells the the true story of Patsy Cline’s friendship with Houston housewife Louise Seger. Seger first heard Cline on the “Arthur Godfrey Show” in 1957, and became an immediate and avid fan of Cline’s and she constantly hounded the local disc jockey Hal Harris at KIKK Houston to play Cline’s records on the radio. “Always… Patsy Cline” featuring Jacque Clydesdale as Patsy Cline and Leslie Green as Louise Seger at the Roxy Regional Theatre. The relationship, which began as fan worship evolved into one of mutual respect. It is the kind of relationship that many fans would like to have with their heroes. Over a pot of strong coffee, the two women chatted about their common concerns. When Cline finally left for Dallas, her next show, the two women had exchanged addresses and telephone numbers. 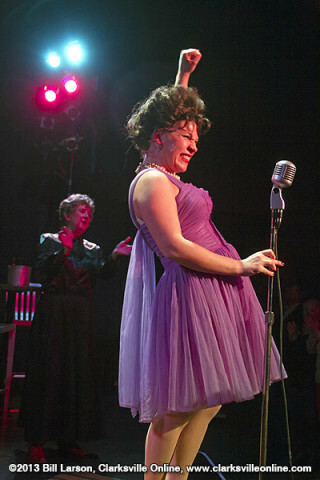 Jacque Clydesdale as Patsy Cline. After Cline left, Seger never expected to hear from her again. But soon after she left, Seger received what was to be the first of many letters and phone calls from Cline. Their pen-pal relationship provides much of the plot of the show. The Roxy Regional Theatre’s Production features over 25 of Patsy Cline’s most unforgettable hits, including “Walkin’ After Midnight,” “I Fall To Pieces,” “Crazy,” “She’s Got You,” “Your Cheatin’ Heart” and more, this beloved musical features a live band consisting of Tom Thayer (piano), John Waddle (guitar), Jarrod Jackson (steel), Scott Emerson (fiddle), Bruce Ervin (bass) and Thad Wallus (drums). Any discussion of this show has to start with the music, and these wonderful Patsy Cline songs make up the heart and soul of this show. Cline was best known for her rich tone, emotionally expressive and bold contralto voice which she developed after a bout of throat infection brought on by rheumatic fever at age 13, Jacque Clydesdale has absolutely no problems channeling Patsy Cline during her renditions of these unforgettable songs. The atmosphere of the show is fully complete as Clydesdale with her costuming even bears an uncanny resemblance to Cline, as you will see from the attached photo gallery. It’s quite easy to slip back through time traveling back to honky-tonk clubs of the late 1950s, and early 1960s, as you watch this show. I’ve always said that the Roxy Regional Theatre has a knack for perfect casting on each of their productions. The sets are wonderful especially Seger’s 1960’s kitchen. I also love the play of colors in the lighting which resulted in some amazing photographs of this performance. The show runs through March 2nd. Tickets are $25.00 for adults, and $15.00 for kids 13 and under. Tickets may be purchased online at www.roxyregionaltheatre.org, by phone at 931.645.7699, or at the theatre during regular box office hours (9:00am to 2:00pm, Monday through Friday). This is a must-see show! Not only do you get to enjoy the wonderful Patsy Cline music, you get to watch as two amazing actresses as they play off of each other’s talents. Go see it! 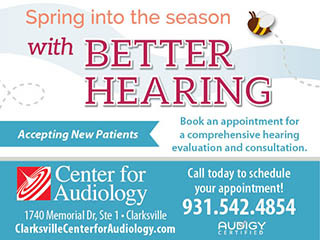 For more pictures, see the Discover Clarksville Photo Gallery.